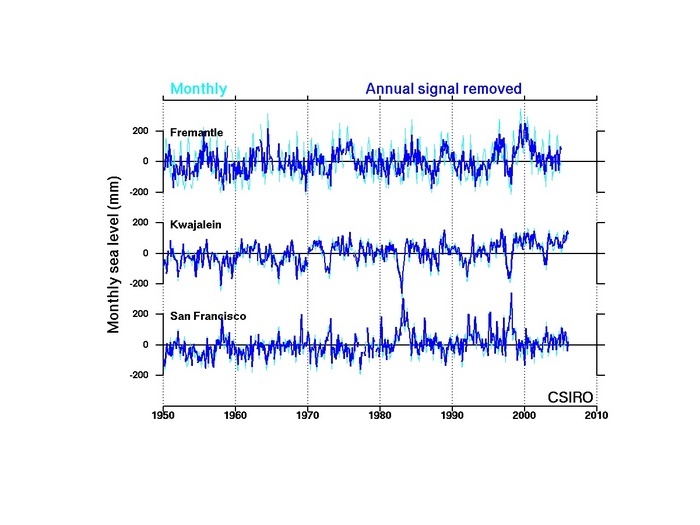 An important cause of intra-annual sea level change is the annual warming/cooling cycle in both hemispheres - in each hemisphere the oceans warm and expand in summer and cool and contract in the winter. Thus the sea levels in each hemisphere are higher in summer and early autumn, and lower in winter and early spring. Inter-annual to decadal variability in the ocean-atmosphere system can cause large-scale changes in sea level. 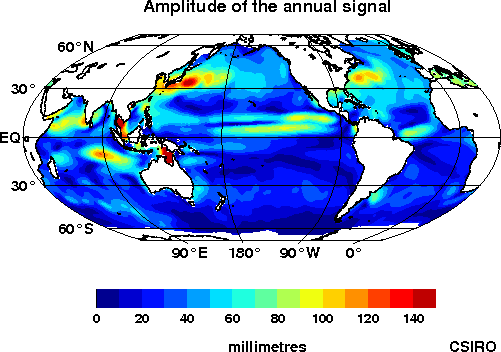 For example, El Niño events cause coherent changes of up to 20-30cm in sea level from the eastern Pacific Ocean to the eastern Indian Ocean, as shown by the plots of sea level from tide gauges below.